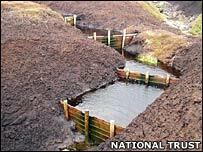 The UK government should conserve peat bogs as a way of curbing climate change, the National Trust is urging. British bogs store carbon equivalent to about 20 years' worth of national industrial emissions, the Trust says. But two centuries of damage in some regions mean bogs are drying out, releasing carbon into the atmosphere. The Trust wants the government to reward landowners for looking after peatlands, and allow carbon credits for good peat conservation. "The way we manage our peat moorlands has a massive bearing on our ability to tackle climate change," said Director General Fiona Reynolds. "But this area is almost completely neglected in terms of any coherent policy response. It is the forgotten climate change timebomb." It is estimated that globally, peat stores twice as much carbon as forests, and the UK contains about 15% of the world's peatlands. Healthy peat absorbs and stores carbon; but as it degrades, the carbon is released, ending up in the atmosphere as carbon dioxide. 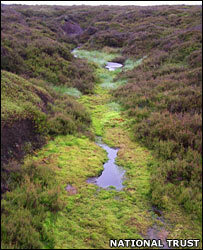 In Britain, particularly England, peat has been badly affected by drainage - which has allowed bogs to dry out - burning, overgrazing and industrial pollution. The higher ambient temperatures seen over the last decade are a new threat. The National Trust believes this may be contributing significant quantities of carbon dioxide to the atmosphere - but says the exact amount is not known. "We can only make a 'guesstimate' at how much UK peatlands are leaking carbon, because only certain peatlands have been studied in any detail," said Assistant Policy Director Ellie Robinson. "There are just a handful of people working on this, and there's a desperate need for new funding and co-ordination of research." What evidence there is suggests that in Scotland, bogs are still absorbing carbon from the atmosphere, while those close to England's traditional industrial heartlands have been turned by centuries of sulphur and heavy metal pollution into net sources of CO2. In the Trust's High Peak Estate in England's Peak District, scientists found that 1,350 hectares of degraded bog were releasing 37,000 tonnes of carbon per year - equivalent, it calculates, to the annual emissions of 18,000 cars. The Trust is advising landowners to protect bogs by blocking gullies to raise water levels, reducing grazing, preventing fires and managing local tourism. It wants the government to include good peat practices in stewardship schemes which reward farmers for good environmental management. It also says landowners should be eligible for carbon credits for managing peat in such a way that emissions are reduced. Credits could then be bought and sold through mechanisms such as the European Emissions Trading Scheme. A government spokesperson said these issues are already being looked at. "Defra is very aware of the carbon issues raised by the management of peat soils, and takes this very seriously," she said. "Tens of thousands of hectares of peat bog are currently being managed through agri-environment schemes in a way which will help to combat the negative impacts of climate change." Defra is also reviewing its environmental stewardship schemes to see if it can contribute better to climate change mitigation and adaptation. "It's not too late to keep our peatlands in a healthy condition," Ms Robinson told the BBC News website. "But if we don't, I'm afraid we're in danger of losing the UK's largest carbon store."